During the Referendum campaign, 70% of Theresa May’s cabinet advised Britain to remain in the European Union and the Single Market. That’s 16 cabinet ministers out of 23 who concluded and concurred that it was in the country’s best interests to stay a member of the EU. Yet only three weeks after the Brexit result, those 16 Tory politicians volunteered to form a government to take Britain out of the European Union and the Single Market – going entirely against their own advice that this would be detrimental to the country’s interests. What had changed in the space of three weeks? Did all those politicians suddenly decide that their support for Britain’s membership of the EU was wrong? On what basis? Since in just three weeks, none of the facts had changed. Or were these government ministers persuaded to change their minds simply because, by a wafer thin margin, more voters chose Leave than Remain? If so, what does that say about their political judgment? That if enough people tell them to, they will abandon their beliefs, principles and considered opinions? The majority of the government’s cabinet ministers are now acting against their own strong advice. Here’s a summary of what they told us during the Referendum campaign. “We are the world's fifth largest economy. We've been in the European Union for the last 35 years so it hasn't held us back, it's actually helped us. That's one of the things that I think are of vital importance." “As part of the single market, we've attracted the lion's share of foreign investment into Europe: every day, foreign companies invest £142 million here. American and Japanese companies tell me that if we quit, we cannot expect that investment or those jobs in future. All the above are not just ordinary Members of Parliament. They comprise the majority of our government's cabinet ministers. They strongly urged Britain to remain in the EU and the Single Market in the interests of the country’s prosperity and security. So why are they all now ignoring their own advice, and leading Britain on a path that they had unanimously agreed would be profoundly destructive to the country’s best interests? 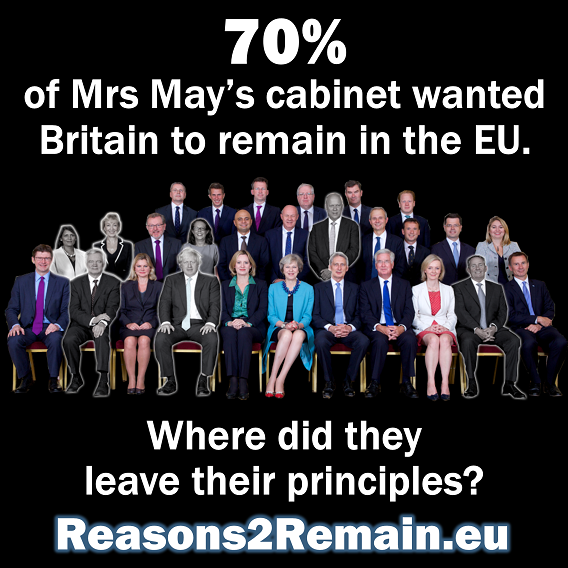 • There are just seven members of Mrs May’s cabinet who campaigned for Leave. They are Boris Johnson, Foreign Secretary; David Davis, Brexit Secretary; Liam Fox, Trade Secretary; Chris Grayling, Transport Secretary; Baroness Evans of Bowes Park, Leader of the House of Lords; Andrea Leadsom, Environment Secretary; Priti Patel, International Development Secretary.